The Iranian Revolutionary Guards Corps (IRGC) is one of the bulwarks of the Iranian government. It was created during the 1979 Iranian Revolution out of a series of different militias to protect the new regime and its ideals. When the Iran-Iraq War started the next year the IRGC became an integral part of the fighting force. Its role quickly expanded in the following years, destroying factions within the government Ayatollah Khomeini disapproved of, gaining an economic empire rebuilding the country after the war, and putting down the protests following the 2009 election. Internationally it helped create Hezbollah in Lebanon, supported Hamas in Palestine and backed and created Iraqi opposition parties, and became major supporters of Syria and Iraq. Vanguard of the Imam, Religion, Politics, and Iran’s Revolutionary Guards by Afhson Ostovar attempts to explain this history using Shiite religion, Iranian politics, and the conflicts that country has faced since the 1970s. Part of Shiite religion is emulation of leading clerics, which is the basis for the IRGC’s role in Iran. Ayatollah Khomeini created the concept of vilayat al-faqih, rule of the just jurist or senior cleric who would provide spiritual and political leadership in an Islamic state. When the revolution against the Shah of Iran began in 1978 Khomeini became its main leader uniting the opposition and gaining widespread international coverage. His followers formed various militias to fight the government, which eventually became the Iranian Revolutionary Guards Corps in 1979. Rivalries and fighting with other groups after the overthrow of the Shah allowed Khomeini the opportunity to use the Guard to eliminate opposition factions and solidify his hold over the country. This set the IRGC’s position in society due to its devotion to Khomeini and its role as protectors of the new religious government. In 1980, the Iran-Iraq War broke out giving the IRGC the first opportunity to expand. At first, the IRGC was an auxiliary force for the Iranian military. After the use of human wave attacks led to victories in 1982, the IRGC became an equal partner to the army. It promoted the war as a religious struggle where the righteous were fighting against the unjust Saddam dictatorship, and claimed that Iran could conquer the holy city of Karbala, and then advance onto Jerusalem. It also backed Iraqi opposition groups such as the Dawa Party and Kurds, and helped create the Supreme Islamic Council for Revolution in Iraq to help it fight Saddam. The early successes were later undermined by the huge casualties Iran suffered as the war moved into Iraq and became one of attrition. The Iran-Iraq War solidified the Guard’s standing as the defenders of the country. Afterward, it was given huge government contracts to rebuild the country, which allowed it build an economic empire. This is likely the main topic the book fails to deal with adequately as there are only a few pages on the businesses it runs, which has given the group greater autonomy. The first ten years of the Guard would set its following history up to the present day. It would help suppress domestic groups that were seen as opponents of the regime, such as Islamic reformers and leftists who wanted social change and more democracy within the country in the 1980s-90s, and then the Green Revolution in 2009 that protested the results of the presidential election. The IRGC and its auxiliary force the Basij would became the moral police, which it would use to stamp out what it considered foreign, anti-Islamic influences giving it a bigger role in society. Internationally, it would help create Hezbollah after the Israeli invasion of Lebanon in 1982, back Hamas in Palestine, the Iraqi opposition, many of which would come to power in Iraq after the 2003 overthrow of Saddam Hussein, became the main defender of the Assad government when the civil war began there in 2011, and came to the assistance of Iraq when the Islamic State seized Mosul in 2014. Internally the Guard became the main force maintaining the status quo and the rule of Khomeini and then his successor Ayatollah Khamenei. Externally, the Guard was a major arm of Tehran’s foreign policy creating and finding allies against its main enemies, Iraq under Saddam, Israel, the United States, and the Islamic State. 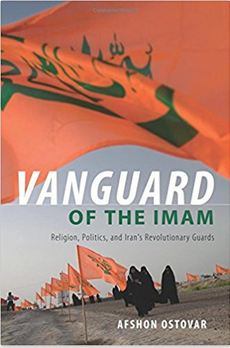 Vanguard of the Imam provides the religious history of Shiism to explain the rise of Khomeinism and how the Iranian Revolutionary Guard Corps was created to support the Ayatollah and preserve his legacy after he passed. Violence and the use of force became an organic part of the Guard when it helped overthrow the Shah and then suppress those factions Khomeini considered a threat to his new regime. Its role in the Iran-Iraq War showed that it was committed to defending the country, which began its expansion into military, economic, policing and foreign policy. Basically, whenever the regime was faced with a crisis or wanted to exert its will in the world, it would turn to the Guard. The IRGC has thus became the main enforcer of the status quo. This has increasingly put it at odds with Iranian society in recent years as there is a large portion of the population that would like liberalization of social mores and more democracy. In foreign affairs, Iran faces conflicts in Syria and Yemen, which means it will continue to be a tool of the regime. Afshon Ostovar is a good place to start to understand this past and present.